← It’s A Wonderful Life Is Real! When most people gaze upon the horrifying image above they probably think that’s Santa Claus being attacked by the monstrous Krampus. A diabolical Krampus who then sets his illuminated eyes of evil upon some helpless kids! However, the devilish depiction is not what you think! That Santa is actually Claude Claus, aka the Anti-Claus. The Demi-Demon master of Dark Christmas. 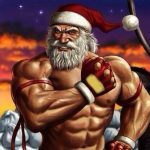 Santa Claus’s twin brother who was once a Demi-Angel that fell prey to the dark side! Krampus was the original Anti-Claus long before Santa or his brother ever existed. This was back in the days before Christmas when the magical winter wonderland of Yule witches and winter Gods like Jack Frost were all anyone knew. At some point, Krampus was ousted by the Anti-Claus and he’s never been happy about it! Despite being the Dark Claus’s right-hand man for a time they ended up parting ways as frenemies and eventually full-on enemies! The interesting image took place on December 23rd, 1972 when Krampus finally saw a way to break free of the ancient magics that stopped him from following his complete dark dreams to fruition. Despite his infamous silver shackles rusting away, he was still unable to harm the innocent. Both the Anti-Claus and Krampus got word of an extremely unique trio of paranormal powered kids who were of a Neutral Holy nature. They were an absolute perfectly innocent balance of good and evil as envisioned by the Queen Of Halloween Shala. Back then her identity was still a secret because she had a bounty on her head by both Angels and Demons as a blasphemous Angel-Demon Hybrid. However, her Halloween emissaries traveled the world 365 days a year to bolster the Halloween Spirit and the goal of peaceful balance between light and darkness. Some high-level forces of evil realized that these supernatural children could be demonically sacrificed for major power and would be a conduit to controlling Halloween Island. In turn, Halloween could be conquered as well. Then it would be a hop, skip, and a jump to dominating Christmas thereby melding it into a Dark Christmas of hellish horror! Both Krampus and the Anti-Claus set their sights on the kids. However, Krampus caught the Bad Claus by surprise and seriously injured him. Despite being a gargantuan beast a Demi-Demon like the Anti-Claus should be far more powerful. Krampus not only used the element of surprise but also a boatload of dark magics he acquired from wicked witches he allied with. Krampus didn’t have the power to kill the Dark Claus and it was only a matter of time before he healed himself. So Krampus rabidly attacked the kids who responded with a volley of psychokinetic abilities directly powered by the Spirit Of Halloween that dwell in their hallowed hearts. Krampus simply wouldn’t go down and eventually the kids found their power exhausted! He moved in for the demonic sacrificial kill when all the sudden a sleigh pulled by nine flying reindeer flew in at ground level and plowed right into him. 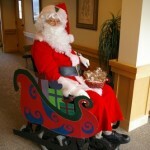 The sleigh screeched to a halt and the Demi-Angel Claus hopped out with a determined smile on his face. Thankfully he had been on a test flight for Christmas and sensed the terrifying events taking place below. As Krampus stood aloft towering over Santa he punched Father Christmas in the face. It had no effect as he laughed,”I turn the other cheek!” Krampus attempted to strike Santa repeatedly after that but he merely dodged him using super speed. Before Krampus could make another move Santa slapped on a set of silver shackles. Krampus screamed out in anger,”Noooooooooo not again!” He was referring to the previous set that took centuries to rust and kept him from doing any harm to people. Santa spun around to speak to the mystical kids but they mysteriously vanished into thin air. The only trace of them was a snow pumpkin nearby that said,”Merry Christmas And Happy Halloween Santa Claus!” Santa then went over to his barely conscious brother the Anti-Claus and healed his injuries. Despite the Dark Claus being the quintessence of evil he still loved his brother and could not stand seeing him in agony. Santa then said,”Claude come back to North Pole City with me! We can bring you back into the light of love and peace.” Claude chuckled,”Give up your pathetic dream brother! 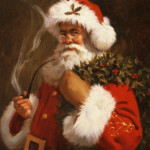 The Devil is the master of this world!” Santa shook his head in disappointment while bidding his brother farewell. He then flew away in his sleigh back to the North Pole. While in the air Rudolph could be heard bragging,”Gosh I can’t believe I took down Krampus guys!” The other reindeer just shook their heads and rolled their eyes. He was technically the first one to ram into Krampus so who knows? 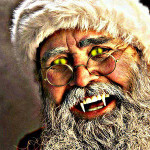 This entry was posted in Anti-Claus, Christmas, Demi-Demons, Demons, Halloween, Short Stories and tagged Horror, Krampus. Bookmark the permalink.